Ninth-ranked and No. 3 seed Texas Tech is hoping this is the year it reaches the Final Four for the first time, but it must get past eighth-ranked and No. 2 seed Michigan on Thursday in the 2019 NCAA Tournament Sweet 16. The Red Raiders (28-6) are making their fourth Sweet 16 appearance and the second in a row, while the Wolverines (30-6) are competing in their 14th Sweet 16 and eyeing a 13th Elite 8. Thursday's tip-off is scheduled for 9:39 p.m. ET from the Honda Center in Anaheim, and this is the first meeting between the teams since December 1983. The Wolverines are 1.5-point favorites in the latest Texas Tech vs. Michigan odds, down a half-point from where the line opened, while the over-under for total points scored is 125. You'll want to see what the SportsLine Projection Model is saying about the game before entering any Texas Tech vs. Michigan picks of your own. Now the model has dialed in on Michigan vs. Texas Tech. We can tell you it is leaning over, and it has also generated a strong against-the-spread pick that hits in nearly 60 percent of simulations. That one is only available at SportsLine. The model knows Michigan won 30-plus games for the second year in a row and has had nine consecutive non-losing seasons. The Wolverines come from a deep Big Ten Conference, which had eight teams qualify for the 2019 NCAA Tournament and went 7-1 in the first round. 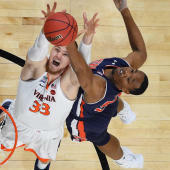 Freshman forward Ignas Brazdeikis has been a chore for opposing defenses to handle and has scored in double-figures in 30 games, including nine of the last 10. Texas Tech must also be wary of the 3-pointer, as Michigan sophomore guard Jordan Poole is a sharpshooter from the outside. He scored 19 points against Montana in the first round and has 115 treys this season, only the 27th Wolverine to ever sink 100 or more threes in a career. Senior guard Charles Matthews is averaging 15.5 points in the NCAA Tournament 2019, including 22 against Montana. But just because the Wolverines have had plenty of tournament success does not guarantee they'll cover the Michigan vs. Texas Tech spread and advance in the 2019 NCAA bracket. The model also knows this is the Red Raiders' 17th tournament appearance and fourth straight winning season. Coach Chris Beard's teams have steadily improved defensively since his arrival and are allowing 10.7 fewer points per game this season than in coach Tubby Smith's final year with the Red Raiders in 2016. Texas Tech has allowed just five opponents to score 70 points and has limited 11 teams to under 55. Sophomore guard Jarrett Culver has been red hot, averaging 25.5 points over the past four games, including 31 at Iowa State and 29 against Northern Kentucky in the tournament-opener. Another potential thorn in the Wolverines' side is sophomore guard Davide Moretti, who has scored in double-figures in 22 of 34 games, including 14 of the last 15.
Who wins Texas Tech vs. Michigan? And which side of the spread hits in nearly 60 percent of simulations? Visit SportsLine now to see which side of the Texas Tech vs. Michigan spread to jump on, all from the advanced model that is up more than $4,000 on its college basketball picks, and find out.